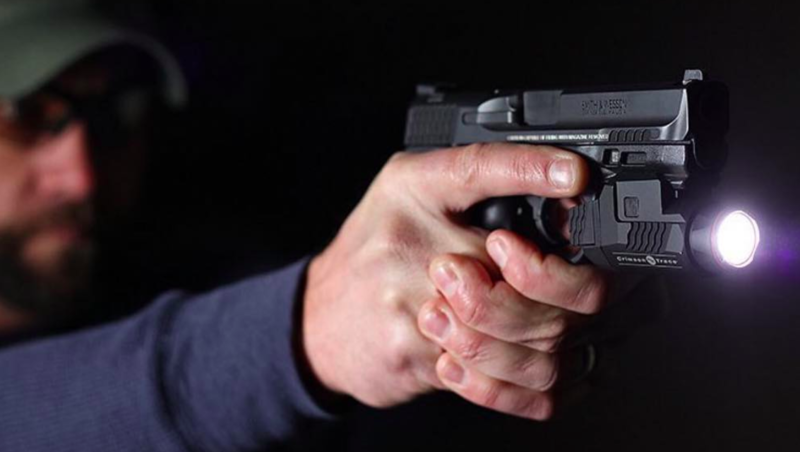 American Outdoor Brands, the parent of Smith & Wesson, reported earnings in the third quarter ended January 31 before charges exceeded guidance as sales grew 2.9 percent year-over-year. 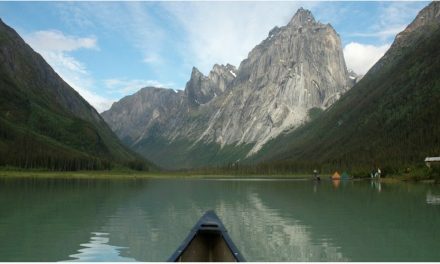 But an impairment charge was taken to merge its Electro-Optics division with its Outdoor Products & Accessories division. The Electro-Optics division includes Crimson Trace Corp, acquired in 2016, and LaserLyte, a provider of laser training and sighting products for the consumer market, acquired in January 2019. Quarterly net sales were $162.0 million compared with $157.4 million for the third quarter last year, an increase of 2.9 percent. The company had guided sales to come in between $155 million to $165 million. Gross margin for the quarter was 33.4 percent compared with 29.8 percent for the third quarter last year. Based upon long-term sales forecasts for its Electro-Optics operating unit, the company has decided to restructure and combine that business with its Outdoor Products & Accessories operating unit in order to drive efficiencies and increase operating performance. As a result of those forecasts, the company conducted an evaluation to assess the fair value of the Electro-Optics operating unit and, as a result, recorded a $10.4 million partial impairment of the goodwill in that operating unit during the third quarter. Including that impairment, the company recorded a quarterly GAAP net loss of $5.7 million, or 10 cents per diluted share, compared with earnings of $11.4 million, or 21 cents per diluted share, for the comparable quarter last year. Prior year GAAP results included a one-time, tax reform benefit of 17 cents a share. 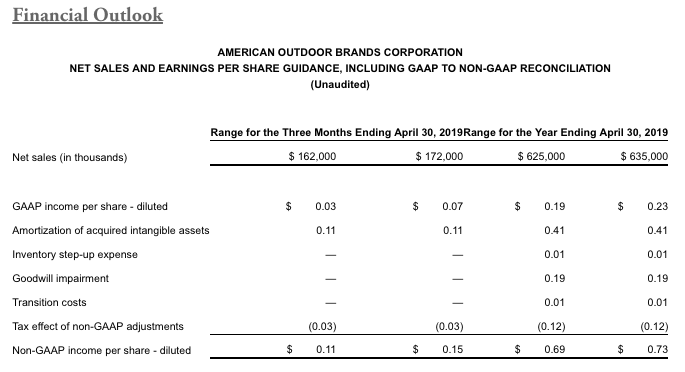 Excluding the impairment, quarterly GAAP net income in the current third quarter would have been $4.7 million, or $0.09 per diluted share. 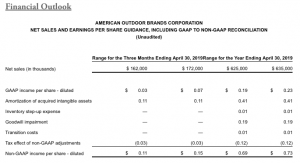 Quarterly Non-GAAP net income was $8.9 million, or 16 per diluted share, compared with $4.7 million, or 9 cents per share, for the comparable quarter last year. Guidance had called for non-GAAP earnings in the range of 9 cents to 13 cents. GAAP to non-GAAP adjustments to net income exclude a number of acquisition-related costs, including amortization, one-time transaction costs, fair value inventory step-up expense, one-time tax reform benefits, and the goodwill impairment from the Electro-Optics division. Quarterly non-GAAP Adjusted EBITDAS improved to $24.4 million, or 15.0 percent of net sales, compared with $20.0 million, or 12.7 percent of net sales, for the comparable quarter last year. The company reports two segments: Firearms and Outdoor Products & Accessories. Firearms manufactures handgun, long gun, and suppressor products sold under the Smith & Wesson, M&P, Thompson/Center Arms, and Gemtech brands, as well as provides forging, machining, and precision plastic injection molding services. AOB Outdoor Products & Accessories is the industry leading provider of shooting, reloading, gunsmithing, gun cleaning supplies, specialty tools and cutlery, and electro-optics products and technology for firearms. Brands under the Outdoor Products & Accessories segment include Caldwell; Wheeler; Tipton; Frankford Arsenal; Lockdown; BOG; Hooyman; Smith & Wesson Accessories; M&P Accessories; Thompson/Center Arms Accessories; Schrade; Old Timer; Uncle Henry; Imperial; BUBBA; UST; Lasergrips, Laserguard, LiNQ, Lightguard, Defender Series, Rail Master, and LaserLyte.